Blockbuster payroll report soothes recession fears. The Labor Department reported that the U.S. economy added more jobs than expected last month, suggesting that the labor market was relatively unscathed by the government shutdown. 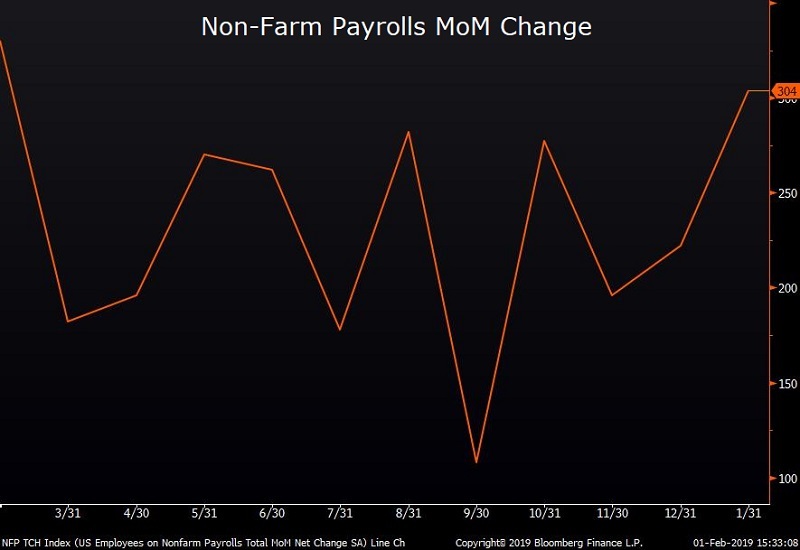 Non-farm payrolls increased 304,000 in January—well above consensus estimates of a 165,000 increase. However, the upside surprise was partially mitigated by 90,000 downward revision to December. The unemployment rate ticked up to 4% from 3.9%, reflecting the impact of furloughed federal workers and government contractors. Wage growth cooled to a 3.2% annual pace, reinforcing the Fed’s patient approach at this week’s FOMC meeting. Rates surge on surprisingly-strong economic data. 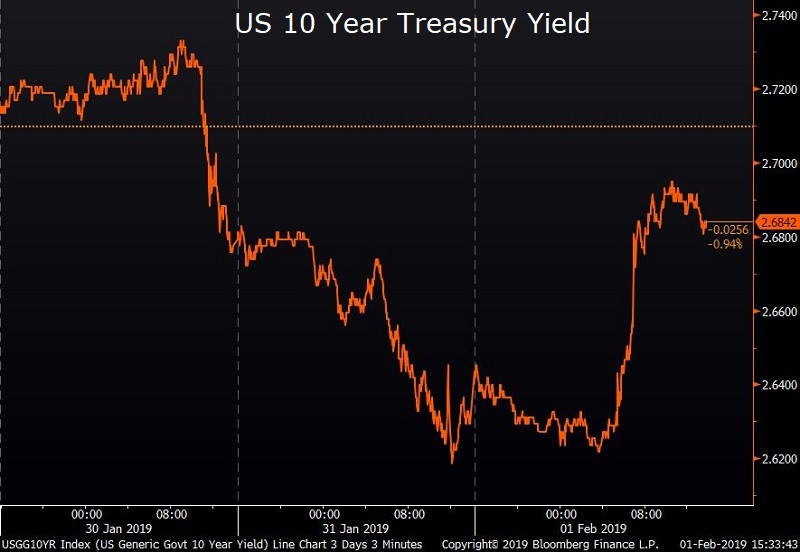 Rates rose as much as 7 bp on the day with intermediate maturities seeing the biggest gains. Ten year treasury yields rose 5.5 bp to close at 2.68%, reversing yesterday’s post-FOMC decline. The equity market’s response was more muted as the S&P 500 advanced .1% while the NADSAQ slipped .25%. U.S. manufacturing bounces back. 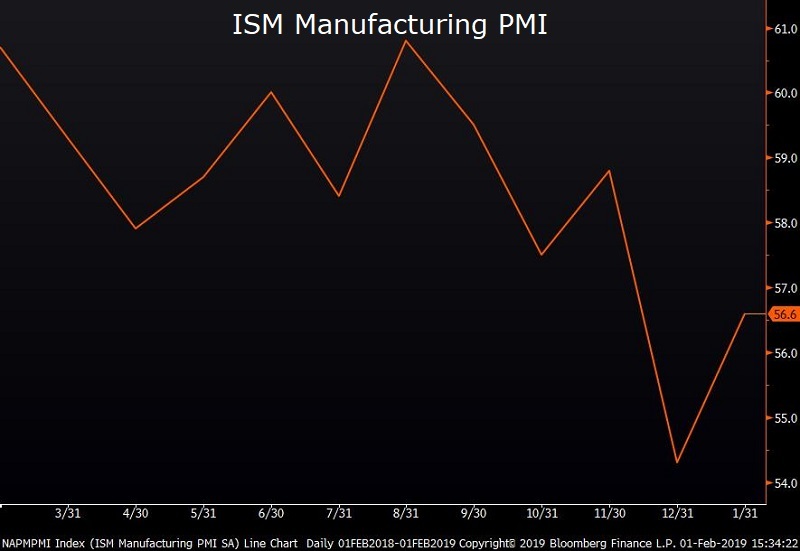 The U.S. manufacturing sector brushed off uncertainty surrounding U.S. trade policy and a slowdown in global growth. The ISM Manufacturing index surged to a robust reading of 56.6 in January after dipping to 54.3 in December. Index readings above 50 indicate an expansion in manufacturing activity, and readings above 55 signal exceptional strength. 14 of the 18 industries surveyed expanded last month. The strong reading helped relieve worries that the factory sector might be slowing sharply. Consumer sentiment slips to lowest level since election. While factory executives remain upbeat about their prospects, the government shutdown appears to have rattled U.S. consumers. 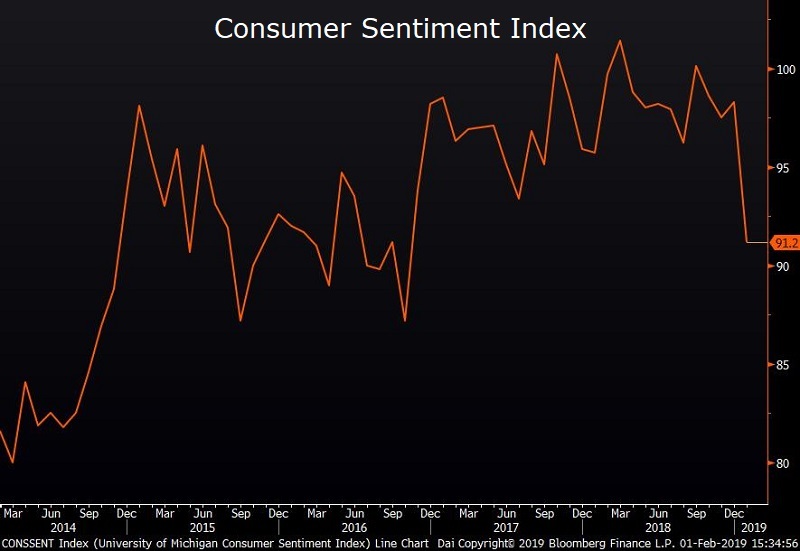 The University of Michigan’s consumer-sentiment index plunged to a reading of 91.2 in January from 98.3 in December, the worst since Donald Trump was elected president. Both the current conditions and future expectations indices fell last month.